The everyday doings recounted to us here by the French schoolboy Nicholas hardly measure up to the convoluted entanglements in which the English William Brown was prone to find himself but the two heroes are alike in their fixed incomprehension of the behaviour of adults and their devotion to their own kind. Classroom friends – the ones you mock, the ones you fight, the ones who are OK for a prank or two – are denizens of the real world. Teachers? Parents? What planet do they come from? 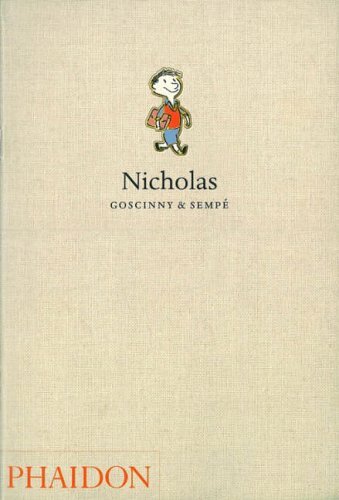 Goscinny, genius author of Asterix (look what happened after he died), first published these incidents in the life of Nicholas in 1960 and their quiet, sometimes satiric, comedy has brought them classic status. Now, this very welcome English translation, while cleverly reworking the format of the French edition (and perhaps even improving upon the placing of Sempé’s delicious illustrations) offers a proper hospitality to Nicholas and reinforces the point often made in BfK that we should benefit more often from what funny foreigners get up to.